Kitchen and Residential Design: Would you? Could you? 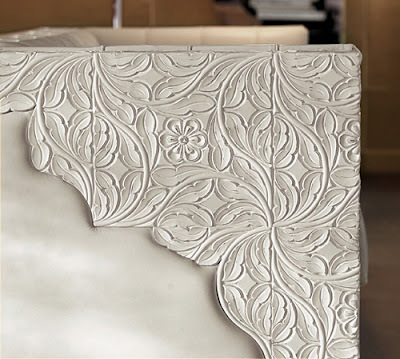 This is an embossed leather sofa from Bizzotto Mobili. I'm on the fence with this one. It's supposed to invoke the golden age of Hollywood. A lot of Italian furniture designs are hit or miss (it pains me to admit that). There doesn't seem to be an off switch. It could have gone either way, but for me it's stunningly beautiful! - in someone else's house, where that someone else has a cleaning lady. I'd imagine that at my house all that detailed embossed leather would become a giant dust catcher, and highlight my inability to keep up with the cleaning. Love the casegoods in the second pic! Thanks for sharing. Please explain to me the connection between Italy and really awful furniture. LAX: Thanks for weighing in. Raina: I wish I could explain that. I actually like the white couch. Who knew? That sofa scares me. It looks like it's made of tile. The table on the other hand though I'm kind of into. Or maybe I like it because I dislike the sofa so much? Italian taste can be counted upon in the kitchen, at least. Buon appetito! I had a weird random association with the leather sofa photo; it recalled the somewhat risque lines in the quirky band Cake's song of the same name "Italian Leather Sofa". I'll leave it at that! There are no wrong answers, it's just interesting to see people's reactions. The multiple textures- subtle and in your face are bang-on though. I like the light and shadow-play on the high-gloss side board and end table too. The tile in the background looks suspiciously like Grespania's Origami wall tile too- a nice choice. 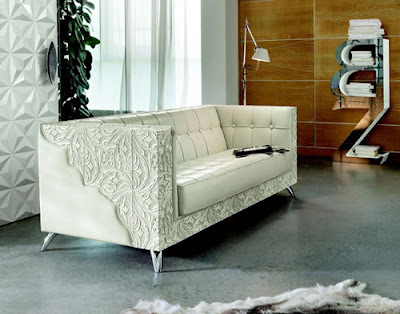 I like the white sofa but think if is is to evoke "hollywood", it needs more glamour (maybe a different fabric?) - A bit too BLAH for me. And...what is with the martial arts guy there? Ralph Maccio is making a comeback. I agree with Raina on the Italy/Bad Furniture paradox. I live in a very Italian area of town and there are so many furniture showrooms filled with black lacquer crap I can't believe it. Their kitchens on the other hand ... bellisimo. See how the martial arts guy's hand and foot are lined up with the gymnast's? Very clever. You are all missing the entire point... that picture is there for one reason, plain and simple: because air-kicks are awesome! You're right Ryan, air kicks are awesome. Are you allowed to say that out loud? I've never heard a Miamian own Miami's tendency to go over the edge. My knee jerk reaction to the sofa; immediately was tooled leather cowboy boots. To me it is kind of cool in a 'home on the range' kind of way. I read you loud and clear Brenda.